Spanakopita comes in many variations all over Greece and, I dare say, all over the Greek diaspora, too. The timeless appeal of spinach, onions and feta are why this iconic savory pie is such a classic. To find some of the artisinal Greek products you'll need to make this, visit my online shop here, where you'll discover a host of lovingly curated Greek ingredients. In a large deep skillet or wide pot, over medium flame heat two tablespoons of olive oil and cook the onions and scallions until soft and translucent, about 8 minutes. Transfer the mixture to a mixing bowl. In the same skillet, add the chopped spinach in batches if needed and heat until most of the liquid cooks off. Drain the spinach very well in a colander and add to the onion mixture. Mix in the herbs and feta. Season to taste with salt, pepper and nutmeg. Let the filling cool. If the filling is too wet or loose, mix in the bulgur, rice, or trahana, which will absorb excess liquid as the pie bakes. Preheat oven to 350°F/180°C. Divide the homemade phyllo into 4 equal balls. Lightly oil a 15-inch round baking pan. Roll out the first ball to a circle slightly larger than the circumference of the pan, enough so that a bit of the dough’s edges hangs over the periphery. To place the rolled out dough sheet in the pan, fold it in half and then in half again, so that it looks like a rounded off triangle. Place the tip of the triangle in the middle of the oiled baking pan and unfold the phyllo sheet to cover the surface of the pan and hang a bit over the sides. Brush generously with olive oil. Repeat with the second sheet, brushing it generously with olive oil. Spread the filling over the phyllo and repeat the rolling procedure with the third phyllo ball, oiling that layer, too. 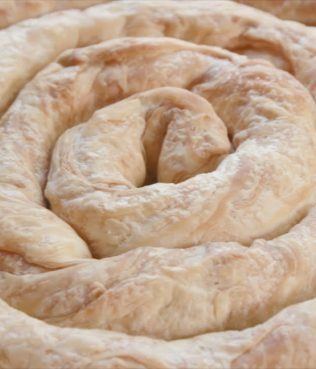 On the top and final layer, lay the phyllo down decoratively: Hold it over the top of your hands and wrists and place it gently over the surface, letting it fall in uneven folds over the surface. Using scissors or a knife cut off excess dough and leave a 1-inch/2.5-cm overhang, then join the excess top and bottom layers together to form a rim around the periphery of the pie. 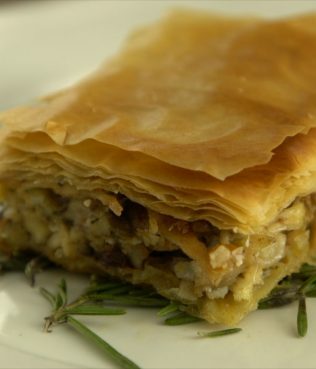 Score the phyllo into serving size pieces, brush the top layer with olive oil, and bake for about 45 to 55 minutes, until the phyllo is firm, set and beautifully browned. Remove and let cool for at least a half hour before serving. Note: You can use commercial phyllo for the spinach pie, too, of course. 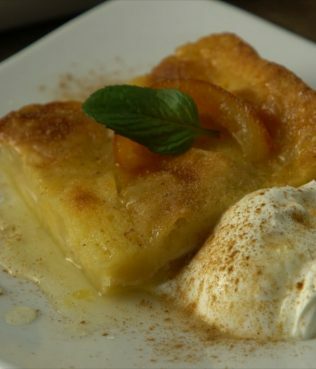 If using commercial phyllo, defrost overnight and bring to room temperature before using. Layer 8 sheets on the bottom, brushing each with olive oil. Spread the filling over the pastry. Layer and brush another 6 sheets of phyllo. Sprinkle the top sheet with a little water and score into serving pieces. Bake and serve as above.